Is your new coffee table contributing to the deforestation of African rainforests? If the furniture comes from China or other parts of Asia, there’s a good chance it is. While much attention has been devoted to Chinese demand for exotic animals as a driver of poaching in Africa, UCLA researchers revealed another way the continent is being exploited — the Chinese demand for wood. And this time, United States consumers are a driving force. A study published in Area, a journal of the Royal Geographic Society, combined economics and conservation biology and discovered an increase in Chinese timber imports from Central Africa that coincides with loss of tree cover. According to United Nations data, between 2001 and 2015 exports of wood to China doubled from countries in the Congo Basin — with half coming from two countries: Cameroon and the Central African Republic. Looking at satellite imagery, the UCLA researchers found that the exports correlated with a loss of tree canopy. Researchers also looked at other potential drivers of deforestation, such as palm oil production and population growth, but only exports to China showed a positive correlation. Although people from other countries buy wood furniture made in China, “their imports pale in comparison to U.S. imports of such furniture,” the paper noted. Trevon Fuller, lead author of the study and assistant adjunct professor with UCLA’s Center for Tropical Research, said shoppers can fight the problem by making eco-conscious choices. “Consumers in the U.S. are buying a lot of cheap furniture that’s made in Asia,” Fuller said. “They could instead buy sustainable alternatives like bamboo furniture or sustainable wood” such as products certified by the Forest Stewardship Council, which come from responsibly managed forests. Another fix could be new regulations from African governments. The paper found Gabon was the top source of hardwoods until 2010, when the country enacted regulations prohibiting the export of uncut logs. The regulations forced companies to purchase wood that has already been cut at local mills, making it harder for illegally forested wood to be taken, Fuller said. Since then, the timber industry shifted to neighboring countries. The Congo Basin is the second-biggest source of hardwoods used to make furniture in China, Fuller said. With more than 1 million Chinese-born people living in Africa, the country has had a huge presence on the continent for decades. However, stopping all logging isn’t a viable solution. In parts of the basin, timber is the largest industry — eliminating it would destroy livelihoods. “But if harvested timber isn’t sustainable, it’s very detrimental to the environment,” Fuller said. Fuller witnessed how the logging industry led to destruction in the African rainforest, which is home to numerous vulnerable species including gorillas, pangolins and forest elephants — along with multiple birds and reptiles. For the past two years, teams of UCLA students have been working on another solution with Taylor Guitars — which uses ebony to produce musical instruments. Their goal is to develop ebony production methods that are sustainable for the environment and local economies. Ebony takes 80 years to mature, so one potential answer is “co-cropping,” which means growing another revenue-producing crop such as bush mango alongside the trees to provide an alternative stream of income. “The approach gives communities short-term benefits, allowing fruits to be sold and consumed, along with longer-term benefits for selective harvest of ebony,” said Tom Smith, UCLA professor of evolutionary biology and a coauthor of the timber study. Both the paper and the ebony project are products of UCLA’s Congo Basin Institute, a regional base for scientific research and education that was created to address the region’s environmental and social problems — and to give African scientists a place to conduct research without leaving the continent. Reporting from Rwanda, Smith said hardwood exports to Asia are likely to increase further because of a new port in Kribi, Cameroon. Intact section of rainforest in Cameroon. 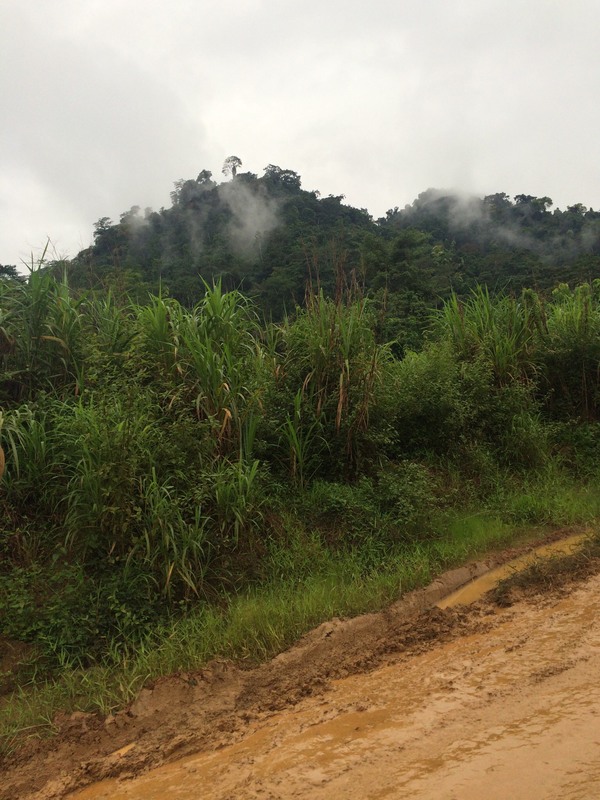 An area of rainforest in Cameroon that has been cleared by logging.